An unknown number of Maltese nationals left Libya today on two flights operated by Medavia. This newsroom is informed that the Libyan-Maltese company operated one flight from Mitiga airport at 11am and another flight at 2pm from Misurata. The second plane landed in Malta some minutes ago. The situation regarding flights from Libya is still unclear but a number of aircraft have also flown from Mitiga to Tunisia. It is not yet known if any Maltese citizens were aboard. 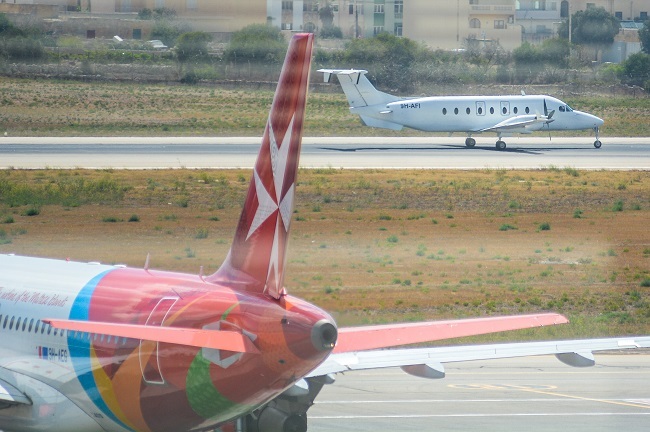 70 Maltese nationals flew over from Misurata on Monday. In the meantime, Japan has closed its Tripoli embassy and pulled all of its staff from the country as fighting erupted in the Libyan capital once again. A number of Japanese businessmen have also been evactuated. The Philippines government, on the other hand, has raised the alert level to 4, which means that some 13,000 Filippino workers are being urged to evacuate. The Maltese government, however, is insisting that there is no need for an evacuation. In the latest developments from the war-torn country, four soldiers were killed on Wednesday after a two suicide bombers detonated their vests near a special forces base. In Tripoli, the airport was hit by another rocket in the past few hours, despite claims by the Zintan militia that it had defeated the airport’s attackers. The Libya Herald reported today that a Grad missile hit one of the petrol tanks at the Brega Oil and Gas Marketing Company’s depot on the Airport Road. A thick column of black smoke was visible from miles away but fortunately the complex did not blow up. If one of thte gas tanks had been hit, many would have died, the paper reports.